The first team made the short trip to Division 1 side Old Glossop for their 2nd Round Bissenden Cup match. On winning the toss Charlesworth asked the home side to bat first. Charlesworth made a good start reducing Old Glossop to 31-3 after 16 overs and 61-4 after 21.4 overs. 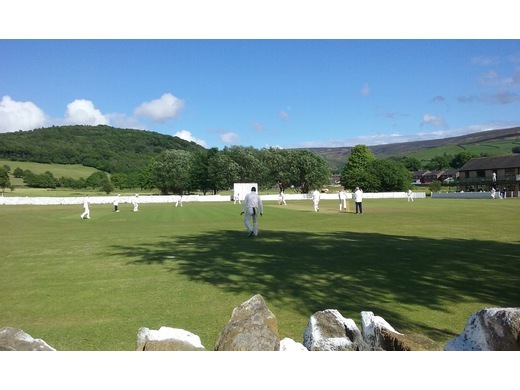 Andy King then made 31 and Steve James 41 as Old Glossop closed on 174 – 8 from their 40 overs. John Wardle finished with 3 – 20, David Wood 2-16 and Gareth Evans 1-17 all from their 8 overs. Tom Harrop switched from wicket keeper to pickup 2 – 45 from 7 overs. Charlesworth in reply needed 4.4 runs an over to reach their target, but runs and wickets came in equal measure as they found themselves 79-6 after 16.5 overs. That brought Tom Harrop to the wicket with John Wardle, and as Harrop smashed it to all parts including Manor Park, Wardle picked up the 1s and 2s at the other end and Charlesworth went on to secure victory. Harrop finished 60 not out from 33 balls (4 4’s and 6 6’s) and Wardle 24 not out as Charlesworth closed on 176 – 6 after 30.4 overs. Division 3 Dinting were the opposition for the 2nd Team in their Hawke Trophy fixture. Captain Steve Kirk won the toss for Charlesworth and elected to bat first. Charlesworth posted 176 – 4 from their 40 overs with Mark Bardsley top scoring with 68 and son Aaron Bardsley finishing 45 not out. It wasn’t enough though as opening batsmen Mike Parker hit an unbeaten 100 and Andrew Tomlinson 50 as Dinting closed on 177-2 in 21 overs. Chris Sims and Sam Gilham picking up a wickets a piece for Charlesworth.